Button-faced gibbons lankily toss themselves through the canopy, a petite mouse deer gnaws at a bush below, and Betek – the chief and shaman of his tribe – methodically whittles another blow dart to such slender precision it nearly becomes invisible to the eye. He sheathes the final product into a vacant hole in the honeycombed interior of his bamboo case and draws another dart from his thick, curly black hair to smooth it out with a leaf coarse as crocodile hide. Like most men from his tribe, his survival solely depends on his weapon — the instrument with which he shall obtain food for his family. He props himself proudly upright with the 1.5 meter bamboo blowpipe held at his side, standing proudly like a giddy child fond of his new walking stick. The hunt this afternoon will be pleasant, for the section of the jungle he has chosen to roam today is shaded with several densely layered canopies creating a green, leafy ceiling two to five stories above his head. 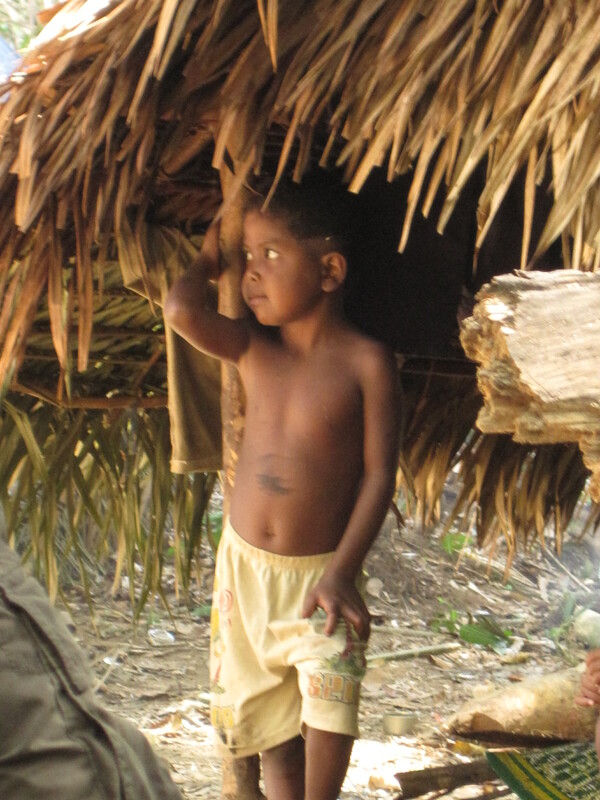 This rainforest has been part of the Orang Asli, or original people, for an unrecorded amount of time, and because time is not a concept Betek is frank with; his age, as well as all the members of his family and surrounding tribes, is unknown – lost in the perpetual heat of the 140 million year old rainforest they call home. Taman Negara, or National Park in Bahasa Malayu, is contested to be “the world’s oldest rainforest,” a veritable time capsule of ferns, fauna, and a way of life that has stood still in content without the knowledge of the end of another year. Back on the hurried streets of Kuala Lumpur, Malaysia’s robust financial hub, Saudi tourists order shisah next to Chinese counting down the days until the celebration of the year of the tiger. The two places might as well be solar systems away with all that they share in common, for if either of these people were to switch places the experience would prove to be overwhelming, if not completely alien. But Taman Negara is not a forlorn planet on some stellar wing. The park marks a bull’s eye directly in the middle of peninsular Malaysia, roughly four hours north of Kuala Lumpur. Malaysia’s capital is an auspicious menagerie of Malaysian, Indian, and Chinese culture that booms with the pulse of a clock ticking a tick too fast. The smell of curry tickles my nostrils on the Bukit Bintang Walk while massage parlors offer to tickle my feet for a negotiable price. A mega-mall, aptly named Times Square, looms over the street where bargains get better every cascading tier of escalators you alight. I’ve just left the air conditioned theatres on the first floor after sitting in for a screening of Avatar in 3-D. The story of mans’ inexorable tendencies to disregard the value of Mother Earth seeks refuge in my mind as I re-enter the streets of the city under the concrete awning of the skyscraper. As Jack Sully in Avatar begins to appreciate the roots of a life alien to himself, can we truly feel no empathy? Bertek and his grandson, who could easily be mistaken for his son, toss fishing nets into the current of the wide river. To the unknowing eye the empty water bottle buoys look like garbage floating in the river. The plastic bottles, whittling knives, and second-hand clothes (replacing the leaves they once wore) are all products of the outside world, which they have adopted in the past nine years since they have begun regular contact with foreigners. Those seeking to experience the elements with them are more than welcomed to stay a night with Betek and his family as your guide. Betek’s people, the Orang Asli, are nomadic by nature, moving only for better food sources or if there is a death in the family; always settling next to a river. The river has always been a key element to making settlements, and in Malaysia this is an attribute very much understood. The Bahasa word for riverbed is Kuala (a tongue also shared by the Orang Asli), a common title found in city names across Malaysia. A narrow boat needles its way for two hours against the current from Kuala Tembeling to Kuala Tahan, where a small group of family-run hotels and hostels nestles themselves on the southern tip of this giant jungle spread out behind a row of floating restaurants. Visitors will only see a portion of this protected lowland rainforest, assuring its preservation while keeping people out of contact with the more territorial members of the park. It’s rare to see larger animals, though their discordant calls can be heard reverberating through canopies in the midst of a jungle ballad. When the ambiguous sounds of the day give way for nocturnal creatures to spring to life, guides will assist you on a night safari down a well-boarded path with flashlights and an open mind for inquiry. Most of the wildlife you’ll see on this trip will be small insects taking the forms of stick bugs, scorpions – and the irritating cicada. From the moment the sun sets, these bulbous bugs the size of both my thumbs pressed together wail with a racketing pomp that sounds like a fire alarm giving up to drained batteries. “The cicada only lives two weeks,” our guide says, “There is not much time, so he always sounds very happy.” If you get lucky, your guide is likely to shimmer his flashlights on the red eyes of a gibbon, samba deer, or mouse deer, the latter being a petite, pointy-nosed cross between a deer and, of course, a mouse. Betek is quite fond of most of these animals — mostly for their nutritional value. 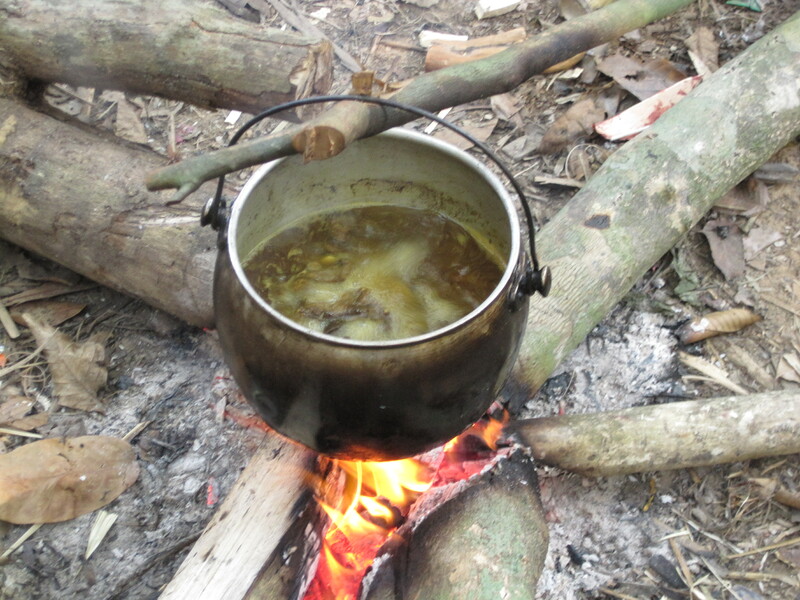 He explains to us over his boiling porcupine soup that spears are wielded when hunting small land mammals, while blowpipes are used to stealthily snipe at birds or monkeys lounging on treetops. Visitors are encouraged to take a shot of a blowpipe at a target in the village, though the weapon is most accurate when shot vertically. Betek unsheathes a fresh dart and places it in the pipe, then dislodges a piece of green hand-made cotton stowed behind his ear to add as a pressure stopper – giving an audience to his crack-shot skill. During the midday hunt he managed to wound a small monkey on the arm. 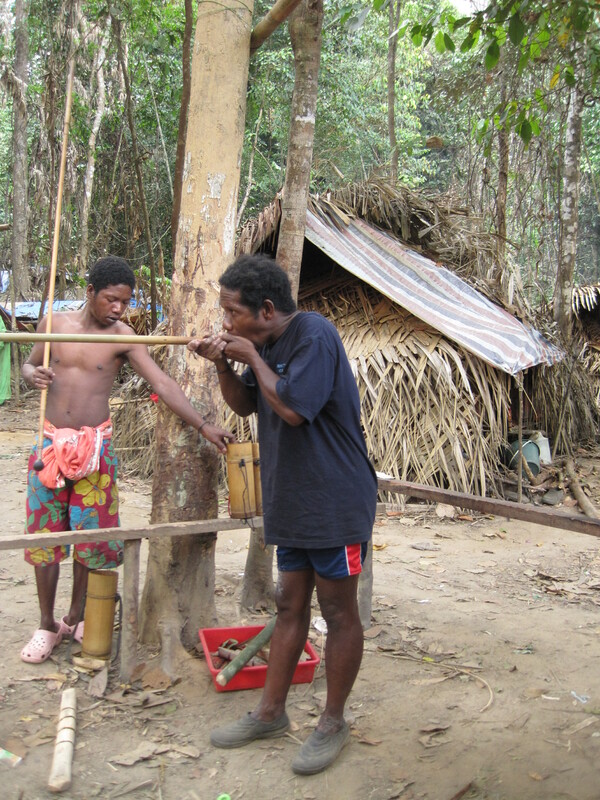 The darts used by the Orang Asli are laced with poison from the sap of a tree that is lethal to small animals. The wound to the arm can be considered a prize shot because after the monkey becomes faint from the poison and falls from the treetops, he will have to amputate the infected part of the body. “Men are good for hunting. Women are good for making homes,” Betek observes while a small bug crawls up his cheek – bringing no vexation to either party. The seven thatched huts and leafy lean-tos that make up this camp have been built by the women of the village. The lean-tos are used by women with newborns so that their lives may be brought into utter publicity, allowing the tribe to unite around the needs of a new member. Planks of wood with donated blankets make up a large extent of the interior. The dirt floor has a hole dug in the corner where meals are labored over day in, and day out. None of them have ever sat in a movie theatre before. The only sounds they are given for entertainment are the chirping cadences of the forest and each other’s company. The Orang Asli, like many indigenous cultures in Southeast Asia, are animists – a spiritual belief sown out of the sanctity of paying homage to the elements of the jungle; e.g., trees, water, sky, ground. Food shortages and the release of a human spirit into the soil are deemed bad omens foreboding enough to abandon camp, usually with the shell of their former lives in tact, to find solace through the course of another transient trek. As chief and shaman, Betek has the responsibility of attending to all medical and spiritual needs of his family. The Malaysian government has donated modern medicine to tribes of the Orang Asli, but the people still stand by methods of the forest, cultivating miscellaneous ferns and saps along the forest floor. Standing 40 meters from the ground below on the longest canopy bridge in the world, I look across the lowland landscape of jungle kicking about in the wind like a vast ocean floor of green anemones. 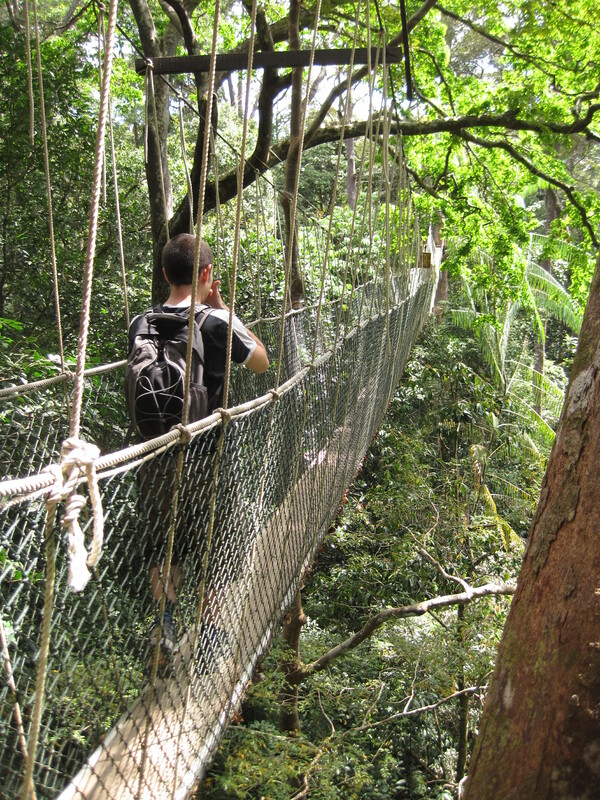 The towering trees along the canopy walk are impending, ominous – appearing to make dents in the sky. The bridge is about 460 to 500 meters long and took me the better part of 15 minutes to walk across, occasionally stopping to totter on the wobbly foot-width of board for a snapshot. The roots of plants slip out of every layer of the dense jungle making a web of life with no distinguishable beginning or end. The Orang Asli have taken up roots below these giants in harmony for a time no clock can count. 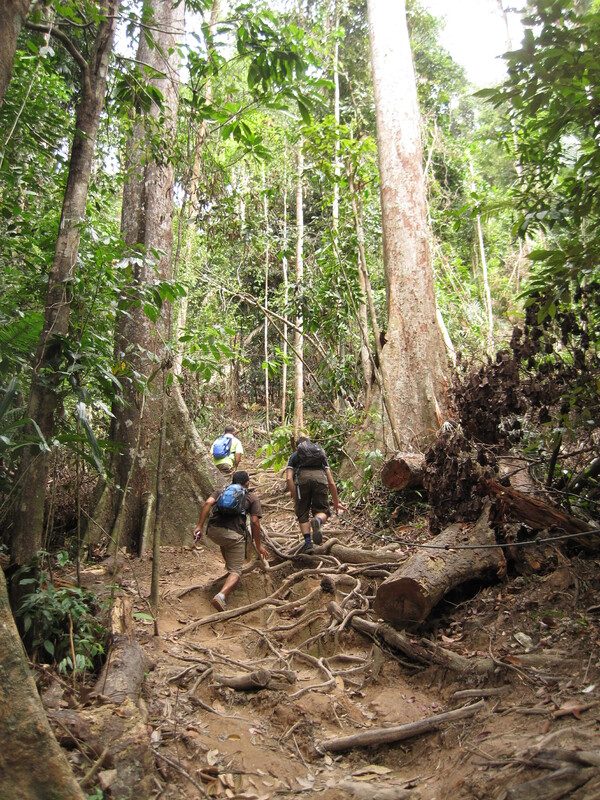 A night out in the jungle of Taman Negara, exposed to the elements of the Earth (not to mention leeches during the wet season), seems an adventure too foreign for most, but Betek’s crooked-toothed grin goodbye tells a different tale. An ineffable sense of pride captures him and his people. Having the opportunity to share their way of life with those curious enough to take notice is a reward they are all too willing to savor and repeat for those yet to come. The gap between our worlds may be vast, but it is clear to see that the rainforest has endowed the untainted spirit of these simple people a human nature akin to the planet which both of us call home. Thanks for your great work and posts about Malaysia. and satay ayam are so nice…… and now I’m hungry..